House Clearance Service In Moorends Rawmarsh Chesterfield Dronfield Hope Valley Swinton Wath Upon Dearne. As well as clearing the usual furniture these small items will also need clearing – A pair of sage green black our curtains 46×54″, A Michael Jackson signed Billie Jean glove in frame with LED lighting, A red Habitat clear perspex digital alarm clock, A butterfly patterned Denby porcelain teapot, A retro style pinup girls patterned double duvet cover and two pillowcases, A brand new challenge extreme 18v cordless hammer drill CD1218MN, A vintage glass red and silver christmas tree topper. 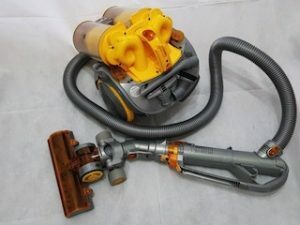 A yellow and grey Dyson DC11 bagless animal vacuum cleaner, with large turbine head. 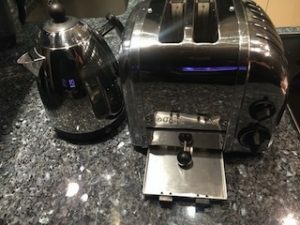 A Dualit polished stainless steel four slice toaster, together with the matching kettle. 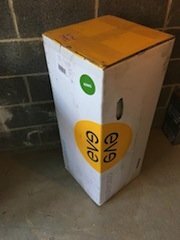 A brand new boxed Eve king size memory foam mattress. 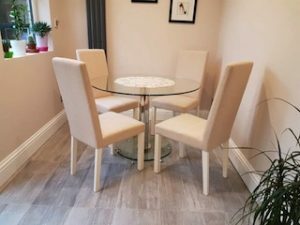 A small glass and chrome circular dining table, together with four high back dining chairs, all upholstered with cream cotton fabric. 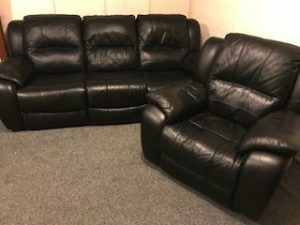 A three seater high back reclining sofa and matching armchair, both upholstered with black faux leather. 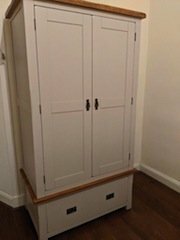 A tall standing painted Kemble oak two door wardrobe, with one large drawer to the base and one shelf inside. 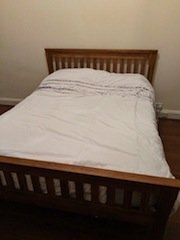 A solid oak 5ft king size bed frame, together with a white silent night king size memory foam mattress. 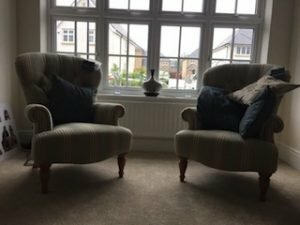 A pair of modern Parker Knoll fireside armchairs on pine turned legs, both upholstered with pale green and mustard striped patterned fabric. A cream metal Ikea four poster small double bed frame with brass finials, together with a white silent night double mattress. 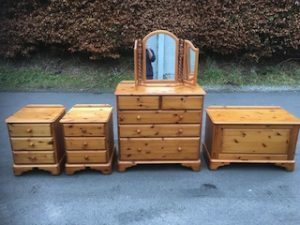 A five piece Ducal pine bedroom furniture suite, comprising a large chest of drawers, a pair of bedside drawers, a large blanket box and a tri folding mirror. 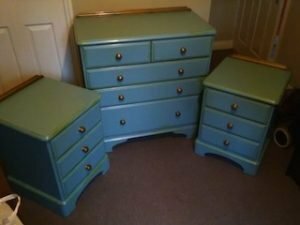 A three piece blue painted Ducal pine bedroom furniture suite, comprising a large chest of drawers and a pair of bedside drawers. 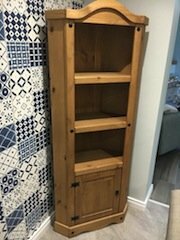 A tall standing Mexican pine corner unit with cast iron mounts, having two shelves above a small cupboard. 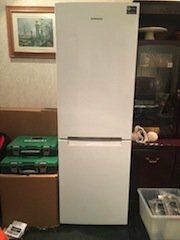 A tall standing white Samsung two door fridge freezer. 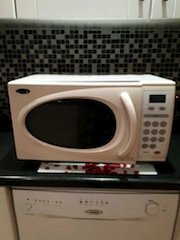 A cream Belling 600w microwave oven, with LED display. 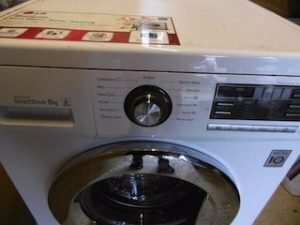 A white LG Direct Drive 8kg under counter 1400 spin washing machine. 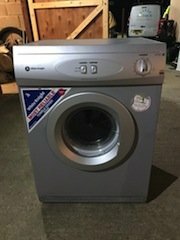 A silver White Knight 6kg under counter condenser tumble dryer.